Take the A or C subway train to West 168th Street. 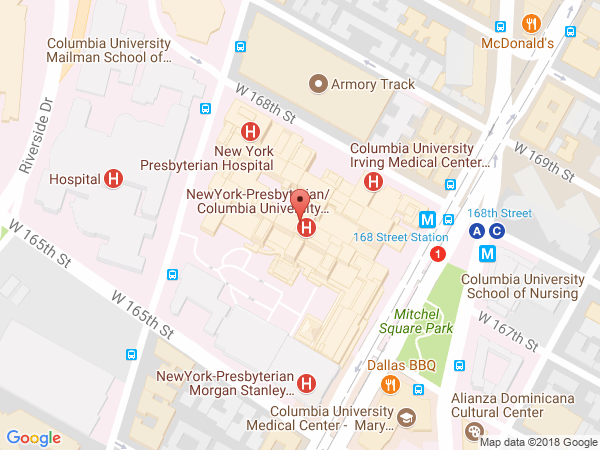 From the corner of 168th Street and Broadway, walk 1/2 block west along 168th Street to 630 West 168th Street (College of Physicians and Surgeons). Please be aware that due to MTA construction, the 1 subway train is NOT stopping at 168th Street and Broadway through early 2020. For alternate directions using the 1 subway train to reach 168th and Broadway please refer to the NYC MTA website. Check in with the guard and tell them you are visiting Center for Radiological Research (internal phone 305-5660). Once you receive a visitor's pass, take an elevator up to the 11th floor. You will be faced with a long corridor. Turn left, walk toward the end (toward Broadway). Our main office is in room VC 11-230.